The ONLY party in town! The Prom is only weeks away! The AFTER PROM Committee has been hard at work since early fall, planning a fun-filled SAFE night for all Junior and Senior students, whether they attend Prom or not. The party will feature lots of entertainment with activities, food, beverages and prizes to keep everyone happy all night long! We strongly encourage all parents to come together to make this the ONLY PARTY IN TOWN! WHO? 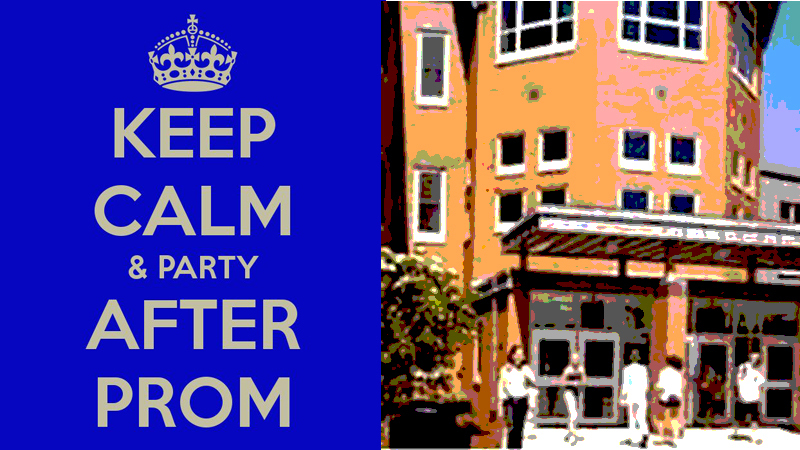 AFTER PROM is for ALL JUNIORS AND SENIORS at SHS. You do NOT need to attend Prom to attend AFTER PROM. Prom Dates from other schools or other grades can also attend, but they must be on the approved Prom Guest List. SHS Students who attend another school’s Prom that night (Sturgis, for example) can also attend with their dates, but will need to pre-register their date by emailing SandwichAfterProm@gmail.com. WHERE & WHEN? Students must arrive at the High School between 11:30 and 12:30 am. Nobody will be admitted after 12:30. Parents may call the school after 12:45 to see if their child has checked in (888-4900). The event ends at 5am. WHAT? The event is FREE! You do not need to sign up or buy a ticket – just show up. There will be LOTS to do (and also plenty of space to lounge and relax)! Bring a bathing suit, towel, etc if you would like to participate in pool events. Dress is casual and comfortable. PRIZES? Prize drawings will take place every 15 minutes throughout the night, with GRAND PRIZE CASH AWARDS awarded beginning at 4:00 am. Students MUST be present to win – check the prize board often to see if you have won! Sign up now to Volunteer on VolunteerSpot: http://vols.pt/cBJFYC – we need helpers to set up (Friday, May 27 from 3-10pm), Chaperone (Saturday, May 28 from 11pm – 5am) and Clean Up (Sunday, May 29 from4am – 8am). We’d especially appreciate parents of Freshmen and Sophomores to help out! Send donations to our PayPay account (use SandwichHighPTSA@yahoo.com). We are also seeking gift card and prize donations email SandwichAfterProm@gmail.com if you are able to donate. Do you have any of these items we can borrow for the evening? No bags will be carried around school – all items will be checked in the office at the beginning of the night – you will have access to your bag throughout the night. Students may leave before the end of the party only with parent notification (students under 18 will need to be picked up by a parent as a junior license is not valid from 12-5am).